The American politician Edwin M. Stanton was born at Steubenville, Ohio, on the 19th of December 1814. He attended Kenyon College at Gambier, Ohio, from 1831 to 1833, was admitted to the bar in 1836, was prosecuting attorney of Harrison county in 1837-39, and practiced in Cadiz, Ohio until 1839, when he returned to Steubenville. In 1847 he removed to Pittsburg, Pennsylvania, where he took a leading place at the bar. One of his most famous cases was that of The State of Pennsylvania v. The Wheeling and Belmont Bridge Company (1849-56), in which, as counsel for the state, he invoked successfully the aid of the Federal government in preventing the construction of a bridge over the Ohio river at Wheeling, Virginia (now West Virginia) on the ground that the structure would interfere with the navigation of that stream by citizens of Pennsylvania. His large practice before the United States Supreme Court caused him to remove to Washington DC in 1856. In 1858 he was sent to California by the United States Attorney General as special Federal agent for the settlement of land claims, and he succeeded in breaking up a conspiracy by which the government would have been defrauded of vast tracts of land of almost inestimable value. Before the Civil War Stanton was a Democrat, opposed to slavery, but a firm defender of the constitutional rights of the slaveholders, and was a bitter opponent of Abraham Lincoln, whose party he then hated and distrusted. In the reorganization of President James Buchanan's cabinet in 1860 Stanton became Attorney General, and he did what he could to strengthen the weak policy of the President in the last months of his administration. Although he had often violently denounced President Lincoln, the latter thought he saw in Stanton a good Secretary of War, and in January 1862 invited him into his cabinet. 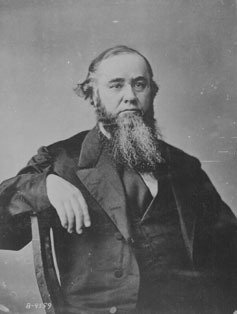 In his administration of the war office Stanton was vigorous, rigid, and often harsh, and his peremptory manner, in speech and correspondence, was the cause of considerable friction between the War Department and the generals, one of the last and most conspicuous instances being his controversy with General Sherman over the terms of surrender granted to Joseph Eggleston Johnston's army. But he removed a horde of fraudulent contractors, kept the armies in the field well equipped, and infused energy into procrastinating generals. Not the least of his achievements was the peaceable disbandment of 800,000 soldiers at the end of the war. Remaining in the cabinet of President Andrew Johnson, Stanton exerted all his energies toward thwarting the policies of that executive, especially those related to the reconstruction of the Southern states. He expressed disapproval of the Tenure of Office Act, making the consent of the Senate necessary for the removal of civil officers, and drafted the supplementary act on Reconstruction, passed over the President's veto on the 19th of July 1867. Stanton was finally asked to resign, and on his refusal to do so the President suspended him (August 12) from office and appointed General Ulysses S. Grant (who had disapproved of the secretary's removal) secretary ad interim. When the Senate, however, under the terms of the Tenure of Office Act, refused (January 13, 1868) to concur in the suspension, Grant left the office and Stanton returned to his duties. On the 21st of February 1868 Johnson appointed General Loreazo Thomas secretary of war ad interim, and ordered Stanton to vacate, but on the same day the Senate upheld Stanton, and by way of reply the secretary made oath to a complaint against Thomas for violating the Tenure of Office Act, and invoked military protection from General Grant, who placed General Eugene Asa Carr in charge of the War Department building, while Congress came to Stanton's rescue by impeaching the President, the principal article of impeachment being that based on the removal of Stanton. When the impeachment proceedings failed (May 26) Stanton resigned and returned to the practice of law. In 1869 President Grant appointed him a Justice of the United States Supreme Court, but he died on the 24th of December, four days after his appointment. Stanton had a violent temper and a sharp tongue, but he was courageous, energetic, thoroughly honest and a genuine patriot.